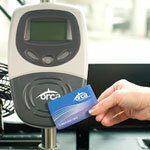 Tap your ORCA card flat against the ORCA logo on the card reader at the front of the bus when boarding. If you are transferring, you get a two-hour transfer that is good on all transit buses, Link Light Rail, Sounder trains, the King County Water Taxi and the Seattle Streetcar. Just tap your ORCA card again on the ORCA reader when boarding. Please have the exact fare ready (you can overpay if you don't have the exact amount); drivers do not carry change. Put your money in the farebox located next to the driver. The farebox has a sign that tells you the fare. If you are transferring, ask the driver for a paper transfer at the time you pay. Metro paper transfers are valid on only Metro buses. If you are paying cash and use more than one transit system you must pay a fare each time you board a different bus. On Metro RapidRide buses, the driver will always give you a paper transfer when paying with cash. This transfer also acts as your receipt for proof of payment. Keep it with you at all times when riding because a fare enforcement officer may ask to see it. Please put the ticket in the farebox located next to the driver. If you are transferring, ask the driver for a paper transfer at the time you pay. Metro paper transfers are valid on only Metro buses. If you are paying with a ticket and use more than one transit system you must pay a fare each time you board a different bus. On Metro RapidRide buses, the driver will always give you a paper transfer when paying with tickets. This transfer also acts as your receipt for proof of payment. Keep it with you at all times when riding because a fare enforcement officer may ask to see it. When you’re ready to board, simply activate the ticket in your app and board the Metro bus. On Metro buses, board through the front door, and show the activated ticket on your mobile device screen to the driver. On Metro RapidRide buses, board through the front or rear doors. If boarding through the front door, show the activated ticket on your mobile device screen to the driver. If boarding through the rear doors, be prepared to show your activated ticket to a fare enforcement officer, if asked. If you are transferring to another Metro bus or Metro RapidRide bus, show your activated ticket to the driver when boarding, or fare enforcement officer if asked. Your ticket is good for unlimited transfers for up to two hours from the time you activate it. The expiration date and time are displayed at the bottom of the screen. You can only transfer between Metro buses and Metro RapidRide buses with Transit GO Ticket. No other transfers to other systems are allowed.